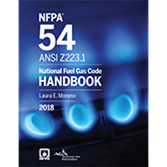 The 2018 edition NFPA 54 Handbook explains the "hows" and "whys" behind fuel gas safety compliance, so you are prepared to implement the latest Code. Fully updated and featuring a wealth of color visuals, NFPA's 2018 edition National Fuel Gas Code Handbook explains technical NFPA 54 requirements and fuel gas safety concepts -- so you can confidently answer questions from employees and owners, and verify that fuel gas piping, appliance, and venting jobs are in compliance. It's an essential tool for engineers, contractors, and consultants who need to ensure fuel gas jobs are done right the first time. This edition's handbook contributors are comprised of fuel gas safety experts. Expert commentary from recognized authorities in the field gives you the background, rationale, and practical tips you need for error-free design, installation, and inspection. A supplement that summarizes research on CSST bonding related to lightning-related damage to fuel gas piping systems. Get the hands-on backup needed to complete jobs correctly and improve productivity.